A superb 19thc Burr Amboyna Tobacco Box. Scottish. C1840-60. 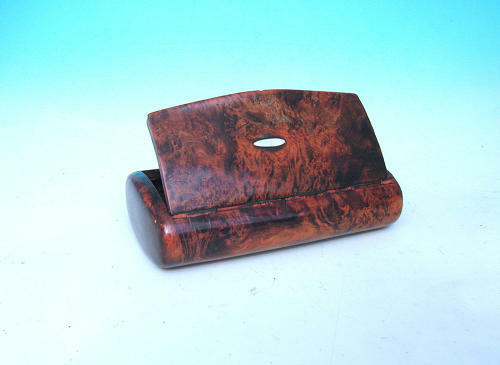 A very impressive quality tobacco box made of burr Amboyna, an exotic wood imported in from Indonesia during the 19thc , it has a rectangle shape and is lined with cow horn. The tobacco box has an integral wood hinge, usually associated with Scotland, and is the perfect size to fit in the pocket. ...The color of the wood has a wonderful natural patina and there is mother of pearl inlaid in the lid .......excellent overall condition.....a real collectors piece..!